Each year RICS presents this honorable award to a person who has contributed most to the understanding of the subjects of Land Transfer, Registration and Administration, Encroachments, Cadastre and Boundary issues. 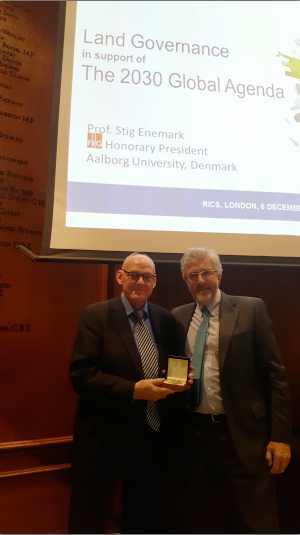 FIG Honorary President Prof Stig Enemark was the recipient of the 2016 Michael Barrett silver medal, awarded by the Royal Institution Chartered Surveyors (RICS) on Tuesday 06th December. He also delivered the Annual RICS Geomatics Christmas lecture title “Land Administration, a global view”. Each year RICS (under the auspices of the RICS Geomatics global professional group board and the RICS Boundaries and Party Walls Panel) presents the Michael Barrett award to a person, member or non member, - To the person whom in the opinion of the Panel/Division has contributed most to the understanding of the subjects of Land Transfer, Registration and Administration, Encroachments, Cadastre and Boundary issues, or to an improvement in the administration of the Laws regarding them, within the UK and overseas. Both RICS Geomatics expert groups, and RICS Land and Resources Global Group, have engaged with and been supportive of The Fit for Purpose Land Administration Guidelines. The development and agreement of the ‘guidelines’ was an impressive achievement. 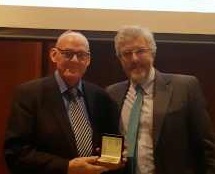 The silver medal award, presented by Gordon Johnston FRICS (Vice Chair FIG Comm 4) stated “your work on the FFP is but one achievement in a long list of achievements including your presidency of FIG amongst many, many more. It is for these achievements that we would like to award you with the 2016 Michael Barrett award”. In recognition that Prof Enemark is one of the most eminent academic (Aalborg University, Denmark) land professionals with significant contribution over several decades and across our global profession. He is highly active within FIG a former President 2007‐2010, Vice‐President 2005‐2006. see: http://www.fig.net/council/president_enemark.htm. Chair, Task Force on Mutual Recognition of Professional Competence, FIG, 1998‐2002. Danish Delegate to the Council of European Geodetic Surveyors (CLGE), 1997‐2006. Director, the FIG Education Foundation, 1996‐2005. He was also President, Danish Association of Chartered Surveyors 2003‐2006 (DdL), Vice‐President 1994 – 03. Chair, the Professional Committee of DdL, 1984‐1994.